Vintage 1950s Metal 7up Door Push Sign > Antique Old Cola Soda Pop Store 7830. Vintage 7up door push sign with beautiful deep color. It would make a great addition to your sign collection. It measures 9" x 3 1/2" wide. 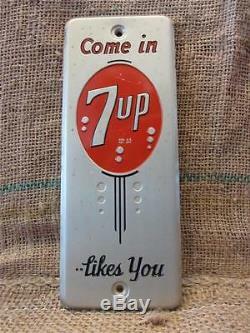 Come On In 7up Likes You, Reg US Pat Off, Made in USA. Good condition for its age without any dents. It has minor to moderate scratches, staining and discoloration, see pictures. See description above for further info on the condition. The item "Vintage 1950s Metal 7up Door Push Sign Antique Old Cola Soda Pop Store 7830" is in sale since Sunday, March 10, 2013. This item is in the category "Collectibles\Advertising\Soda\7 UP". The seller is "*miliki*" and is located in Red Oak, Iowa. This item can be shipped worldwide.